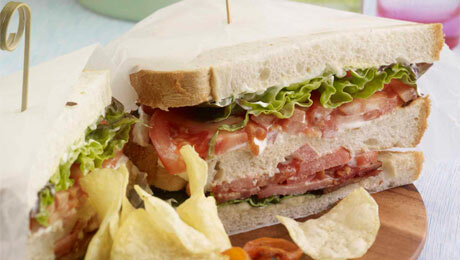 For a tasty lunch option, there's nothing like a BLT. Grill the rashers until nice and crispy. Mix the wholegrain mustard and mayonnaise together. Spread the wholegrain mustard mayonnaise onto the two outer slices of bread. Toast the third slice of bread. Next lay some lettuce and sliced tomato on top of one slice and then 2 pieces of the crispy bacon. Put the toasted slice of bread on top of this. Repeat the process with the lettuce, bacon and tomato and then finish off the sandwich with the remaining slice of bread. Press down lightly and then slice through the sandwich.